A team of 110 athletes will be representing the United Kingdom at the Invictus Games, which take place in Orlando, Florida from 8-12 May. The team is made up of wounded, injured and sick serving military personnel and veterans, and the event, the brainchild of Prince Harry, will feature 500 competitors from 14 nations competing in 10 sports. The selection process for the UK team was based on the benefit the Games will give an individual as part of their recovery, combined with performance and commitment to training. The inaugural Invictus Games, held in London in September 2014, saw more than 400 competitors from 13 nations compete in nine sports and caught the nation's attention. This time, competitors will take part in athletics, archery, wheelchair basketball, road cycling, powerlifting, indoor rowing, wheelchair rugby, swimming, sitting volleyball and wheelchair tennis. While many of those competing will have had physical injuries, others will also have to deal with the mental scars and issues such as post-traumatic stress disorder (PTSD) and depression. Get Inspired speaks to four of those selected for the UK team who will be hoping this year's Invictus Games helps to continue to transform their lives. Background: Caroline joined the Army in 1997 and served tours across the world as part of the Royal Logistic Corps and later in the Adjutant General's Corps, 1 Logistic Support Regiment. She has anxiety, depression and post-traumatic stress disorder as well as having a physical injury to her lower left leg and foot, causing loss of feeling and reduced mobility. In her own words: "It has been immensely important to me to get involved in sport. I became a bit of hermit when I left the army and I needed to build a bit of a social circle. By getting involved with the Sports Recovery Programme I've learned that my life didn't come to an end because I got an injury and because of my PTSD. I've learned new ways of doing sport, lost tons of weight through it. "When I started in January 2015 I couldn't even ride a bike and now I ride a lot. I've done three triathlons - one an ultra last year - and it is become a big part of my life. It gets all of the good endorphins working so you feel better about yourself and meet new people which is fantastic. "My best bit of advice to people who want to get back into exercise is start small. "You don't have to go and do a triathlon like I did. Just go out for a walk; find the one person who will go out and do a mile with you. "Go out for 10 minutes and take it slowly but get out there. Go out and have a walk to a coffee shop and have cake at the end. "The only person who can change things is you, but with support. By getting those good endorphins you will start feeling better over time." Background: Michael, from Sunderland, was medically discharged from service in 2014 after 15 years with the Royal Artillery as a bombardier. He has lumbar spine disease, a degenerative spinal condition, which causes chronic pain and limited mobility, and also has arthritis in the lower lumbar which adds to his pain and mobility issues. Through getting back involved in sport, including with the Newcastle Eagles wheelchair basketball team, he has lost almost eight stone. In his own words: "Sport was important to me when I was growing up and, because of my injury, I thought it had been taken from me for good. "When I first got sent home on sick leave I spent most of my time locked in my bedroom in my parents' house. That was when the depression started and it wasn't very good. "I did a few different things to try to get out of that state of mind and it led to sport, which has helped massively. The camaraderie you have with your friends is probably the main thing you miss when you leave the army. "Getting back into sport has given me back something I thought I had lost and has helped with my confidence and my anger issues. It calms me down and helps with my depression and the issues that otherwise might be bottled up or taken out in the wrong way. "I would encourage anyone to give it a try - there isn't much you can't do if you put your mind to it. I am more active now than for a long time. I still have to cope with the pain of the injury but my wife and kids help enormously and it is great to have that sort of support." Background: 'Scotty' served for 10 years in the army in Bosnia and Northern Ireland but, 18 years after leaving, he was diagnosed with depression and post-traumatic stress disorder. He took part in the Warrior Games in June 2015 in America. In his own words: "Sport is a massive tool for recovery and gives me that goal, that mission and that purpose and it has played a crucial role for me having suffered with a mental illness for over 20 years. "After leaving the services and no longer representing your country, this is a great chance to stand here with my country's flag on my chest to represent the country with the men and women I used to serve with. "I got into sport through Help for Heroes after suffering with a mental illness for over 20 years. Using sport as that recovery mechanism to get me out of the house every day gives me that goal, that mission and purpose and it has played a key role in my recovery. "If I could reach out to anyone back home, especially someone suffering from a mental illness, I would say you can do it - I am testament to that. It took me a long time to ask for help but I'm so glad I did. There is nothing to be ashamed of. I was inspired seeing guys taking part in sport and hopefully I can inspire others. "Without watching the Invictus Games I wouldn't be here - Invictus is powerful." Background: Susan sustained multiple fractures in an accident during service in 2009 while she was serving as a Royal Navy Senior Nursing Officer. She was in plaster over much of her body for some time and gradually moved from a wheelchair to crutches and has been working hard to build muscle strength and fitness. At last year's Warrior Games she showed her determination and defied her lack of mobility by walking the 100m 'dash' on the track to claim a silver medal. In her own words: "When I was in the armed forces, sport wasn't something I was particularly passionate about. I chose to be more involved with dance, especially classical ballet, and I found that a great help, but it is really only since my injury that I've turned my attention to sport and it has been my lifeline. "It helps to get the muscles back into some kind of conditioning and also get moving again but emotionally it helps you to pick you up and get you back to feeling free and ready to face a future. "For women of my age, in particular, it is really important to be active. I know it is hard but getting back into sport, or maybe doing it for the first time, is a great opportunity, not just to get active but to meet people, develop friendships and improve your lifestyle. 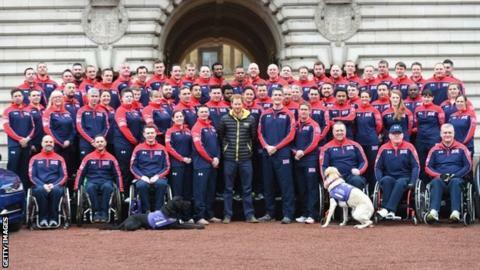 "Being involved in the Invictus Games has been a great honour. It is something I never thought I would do and shows that out of tragedy, good things can come. "It is about new beginnings and I feel privileged and honoured to be surrounded by so many athletes and young people who are using what they have now to find purpose, meaning and destiny and hope for the future."